The Gold View is currently the project possesses a unique position and perfect vision. At The Gold View, residents not only enjoy the fresh air and river life but also enjoy the amenities of the inner and outer suburbs of the central apartment. Everyone knows Gold View District 4 travel areas, districts … extremely convenient and easy. Location for real estate is a vital element. This is the center of districts such as Districts 1,5,6,7 and 8. The source of District 4 is built by the Ben Nghe, Sai Gon, and Kenh Te rivers. Many people call District 4 an oasis or islet because of the cause of formation, the surrounding is all rivers. At present, there is no beautiful district like District 4 in terms of feng shui, transportation on land and waterway is very convenient and easy. From here, you can go to the center of District 1 through Ong Lanh Bridge and Nguyen Van Cu Bridge, go to Districts 2, 9 and Thu Duc through Thu Thiem Tunnel, and go west through Binh Chanh Boulevard through Vo Van Kiet Boulevard. This place is only a few steps away from District 1, it is very difficult to find any project that is located near the center as in The Gold View. The price advantage, this is the decisive factor when buying Gold View, any customer too, before deciding to buy any project, they will almost conjecture about the money intended to buy. Compared with neighboring projects, Gold View has a huge advantage. Living space is full of wind and water, making the health of future homeowners recover faster after hard working days. It is close to the river so this new space is cool living space. Every afternoon you walk scattered on the banks of the Ben Nghe River, you can feel like you are on vacation at a resort. Full of high-class facilities such as swimming pool, garden, shopping center, BBQ, cafe on the terrace, kindergarten… If you have the opportunity to own an apartment in Gold View then it is great. You will enjoy the benefits of Gold View as well as the living space that nature offers. Maritime Bank supported with a preferential interest rate of only 4.99% for the first year, the procedure is very simple and flexible loan with only 2 working days can decide to lend. Customers living in Gold View are known to be upstream, the quality of service here is commensurate and the range of customers, facilities and services are positioned high. The benefits of Gold View as its name implies. 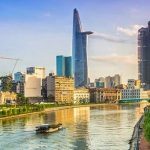 View on the center of Saigon, on the banks of the Ben Nghe River, is considered the core value of the project. Therefore, the number of apartments outside the front of Ben Van Don will be bought quickly although the value of this apartment is higher than the apartments on the other three sides and the total of the whole project. The price of apartments along Ben Van Don is about USD $ 1,800/sqm, this is the price is considered acceptable by investors as well as customers. Adjacent to the center of District 1, most projects are quickly captured by the customer community. The central apartment District 1 average price of about USD $ 3,600/sqm, representing the right level compared to the coastal apartment. Utilities are of international standard, the quality of service is not inferior to a 3-star hotel, so many investors find the price high but it reflects the value. Buy high prices later will sell high prices, rent also gets higher prices and especially show the premium segment level. 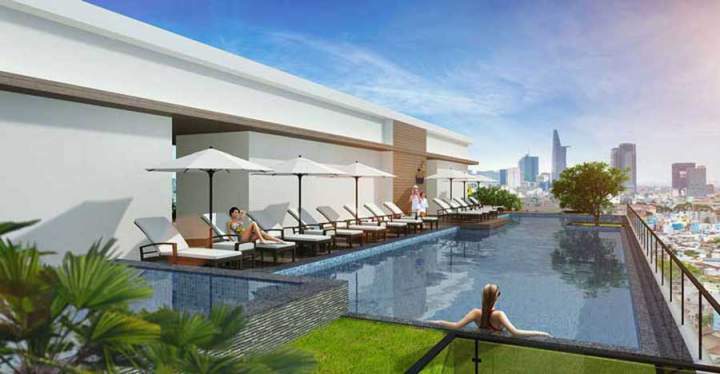 The real estate located in the center of Saigon is never afraid of losing value. Therefore, when offering apartments in District 4 on the banks of Ben Nghe – Ben Van Don River attracted a large number of buyers to buy as well as investment, just passing the Nguyen Van Cu Bridge or Ong Lanh Bridge instead. Only buy an apartment in District 1, they can buy 2 apartments in District 4, more spacious living space, enjoy the living space of water, wind, and water.